Two crop circles appeared at the same night in widely separated locations, and both had hexagram configurations with twelve elements. What does it all mean? And to whom in particular? Messages for the West, for Islam and for Israel. This gives a certain twist to a phenomenon that has been taking place in various places around the earth, but especially on England’s green fields – the overnight appearance of “Crop Circles” with complex geometrical figures, somewhat akin to letters or words in an abstract geometrical language. Among the researchers of this mysterious phenomenon, many see in it an attempted communications between “Heaven and Earth” – if you like, a visual version of the Bat-Qol (voice from heaven in Jewish traditional sources). Some even use the name “Temporary Temples” to summarize the phenomena and their effects. If that is the case, then the general message of this phenomenon, even before any particular message, is a call from the skies (or from the living Earth) to pay attention and empathy to geometrical patterns and their intrinsic meanings. It is a call to walk inside these patterns – or to contemplate the alignment and movement of self and others inside them to perform some mental/spiritual exercise. In the following, I shall try to elucidate and interpret a couple of patterns that have appeared on a summer night (of 24.07.05) in English wheat fields and which recalled to some observers the Vision of the “New Jerusalem”. Here we have a clear expression of the gathering of Twelve around One sacred (Mequdash – set apart) common center. The base of the pattern is of a “one wheel upon the earth” (Ezekiel 1:15) with a circular center set apart, from which extend 12 spokes to the outer ring of the wheel. This construction produces twelve triangular (trapezoid) cells, (akin to a Wigwam tent, if you like). Inside each cell there is a line folded in five sections – reminiscent of a chromosome strand inside a cell nucleus. Recalling its association with cereal or cornfields, it is possibly also an outline for a maze labyrinth or of a city with 12 sectors, where here and there there must be some passages between the twelve sectors. Those who explore it on ground level may wander there to despair, but the acquisition of the bird’s eye view reveals in it the twelve-fold harmony of “how goodly are thy tents, O, Ya’aqov, and thy tabernacles, O, Yisra’el!” (Numbers, 24:5). But this vision also requires its contemplation in quasi-temporal dimension of folding and unfolding, possibly also into added dimension. The East Kennet pattern seems somehow related to the spatial (3D) figure of the Dodecahedron, the 5th of the Five Pythagorean/Platonic “perfect Solids”. The dodecahedron has 12 pentagonal faces - which in turn delineate 5 hexagrams (five-pointed stars), equally distant from a center point. This suggests that the five connected lines inside the 12 cells of the East Kennet surface figure could be released out to unfold into a 5-pointed star. Here there clearly appears “the hexagonal star” (or “The Star of David”), and this in a way that emphasizes its being made of twelve triangles. It is surrounded by a ring or necklace-like hexagon of six hexagrams and six rhombi (flattened squares). 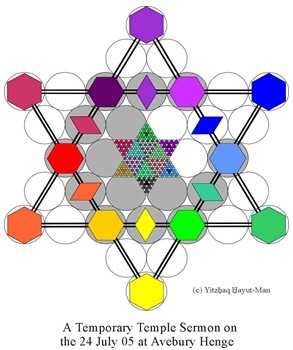 The pattern outlines the expansion of the influence of the inner hexagram (Magen David) by projecting in a dozen of directions (six major from the vertices to the vertices of the star and six minor from the vertices of the inner hexagon). In the points where these (virtual) primary rays enter the surrounding hexagon, there are formed six hexagons and six flattened squares (forms that already exist in the central pattern). Where the secondary rays impinge on that ring there form six rhombi. From these we find that the six hexagons may contain six triangles each and the six rhombi may each contain 2 triangles, which together make 48 triangles. 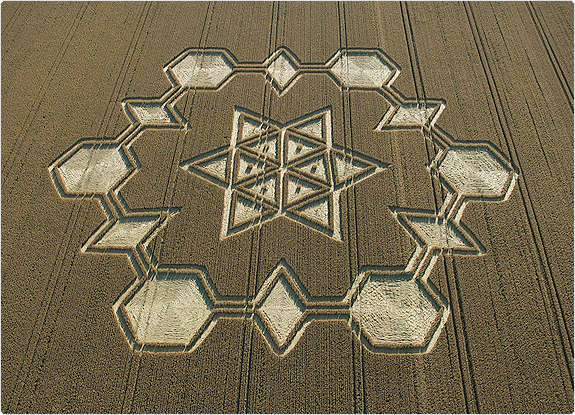 While all the crop circle patterns are essentially 2-dimensional, the employment of hexagonal, rhombic and hexagram-star forms base the Avebury Henge pattern upon an underlying triangular-hexagonal grid. When compared with the generally-employed square grid, which is definitely surface division of 4 directions (Left-Right-Front-Back), the triangular-hexagonal grid point to 6 directions and points (at each local point in the 2D pattern) to possible movement in 3-dimensions (Left-Right-Front-Back-Up-Down). The hexagons generated in the grid can represent a 3D cube, or the complementary form (genomenon) that adds to a cube to form a larger one. For example, a hexagon made of 37 round cells is also the form of the addition of 37 spheres upon a cube made of 3x3x3 = 27 spheres, to complete it to a cube of 4x4x4 = 64 spheres (as 37 + 27 = 64 = 4^3). The Hexagonal Star may be regarded as the symbolic operator for Integration in 3D, compared with of the Cross as the symbol of Integration in 2D. The cross divides between Up and Down (Heaven/Earth; Soul/Body; ….) and between two sides. The agony of the crucifix is the symbol of trying to hold the severed parts together. The Hexagonal Star (“Star of David” for most people) is acknowledged as a symbol of connecting Heaven and Earth, but it seems to give some extra breathing space of that hard process. The first verse of Genesis is associated with the two first “Perfect Numbers” (6 letters in 1st word; 28 letters in 1st sentence). These numbers also pertain to the triangular numbers of 3 and 7 rows. 3 and 7 turn out to be the important formative numbers of the Genesis narratives. Thus the combination of the two numbers 3 and 7, namely 37 and 73. Multiplying them (37 x 73) produces 2701 – The Gematria value of all the 28 letters of the first verse of Genesis. These numbers, 13, 37 and 73 are associated with words. The number 13 with “One” (EHaD) and “Love” (AHaWaH); 37 with “Breath” (HeVeL) and 'The Heart' (haLeV); and 73 is associated with “wisdom” (HoKhMaH). 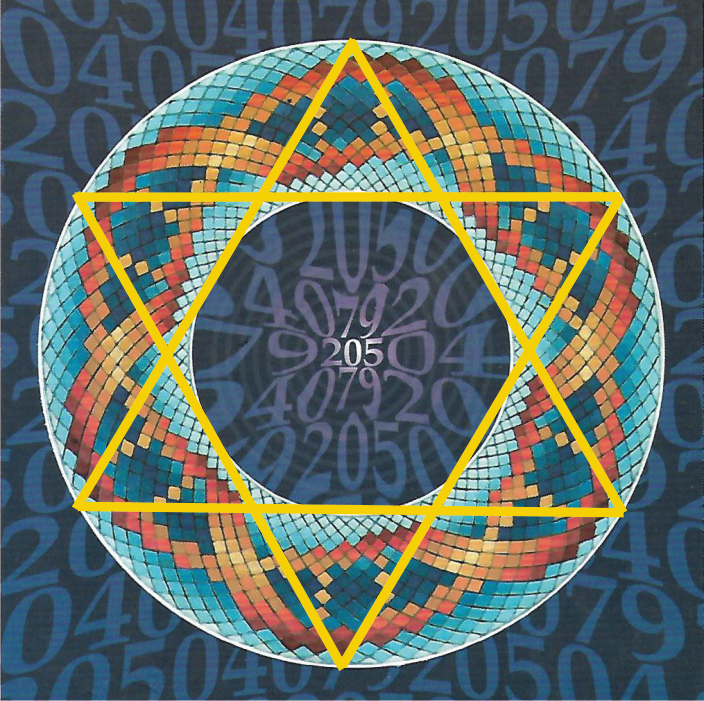 Multiples of the number 37 was then found in the Genesis account of the Creation. In particular, the expression “And the Ru’ah (Spirit/Wind) of God hovering upon the Face of the Water” has the Gematria value of 1,369 – or 37 square. The name of Jerusalem (YeRU-ShaLeM < > 216 + 370) is associated with Holistic (or multidimensional) Vision and with the cube of 6 (6x6x6 = 216). The name of Zion (TsiYON < > 156 = 13 x 12) is associated with a “constellation” of 13 hexagonal stars. The Biblical name YiSRaEL (Israel) has Gematria value of 541, which is the 9th “Hexagonal Star Number”. Most gematria values of groups of names of the 12 Tribes of Israel, as on the High Priest’s divinatory breastplate (Hoshen), are multiple of 37. Altogether, hexagonal star numbers, and the number 37 in particular, are deeply associated with the entire Hebrew Bible account, from the Creation and to the building of the Jerusalem Temple, and the appearance of the New Jerusalem (New Testament, end of the Book of Revelation). This pattern outlines the extension of the influence of the inner hexagonal star as radiation in 12 directions (6 primary ones in the directions of the 6 vertices (points) of the star (hexagram) and the 6 secondary in the directions of the corners of the inner hexagon). 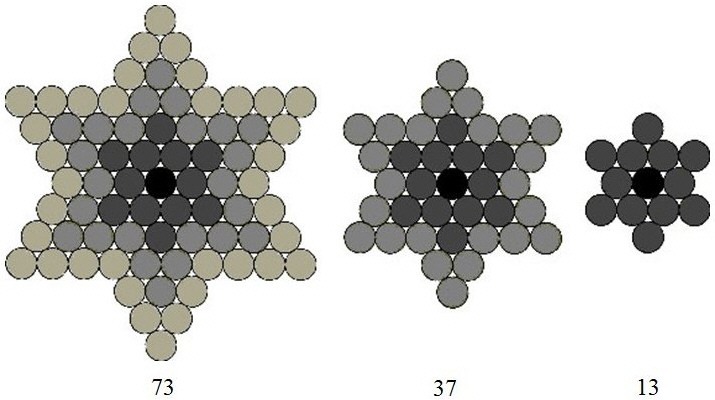 In the places that the radiating rays effect the surrounding hexagon there form six hexagons and six rhombi, forms that are already found in the inner pattern; and from the latter’s arrangement we find that the hexagons may contain 6 triangles, and the rhombi 2 triangles – and together 48 triangles (In Hebrew, 48 is the Gematria of Mo’aH – literally “Brain” and figuratively “acquired intelligence”). As noted, the form of the Hexagonal Star in general, and that of 37 units in particular, as representing “Wisdom” (HoKhMaH). Here, in the Avebury Henge crop circle pattern, we can see a form of the flow of Wisdom (in the Kabbalah, Mohin) to twelve figures. Interestingly, the form of the edges of the surrounding hexagon (two hexagons at the sides, connected in the center by a rhombus) is redolent of the form (in Pask’s “Conversation Theory”) of the building of an analogy (Agreement, Understanding or even novel “Realization”) between a-priori different concepts. A well known association of this form is, of course, that the formation of hexagonal chains is the basis of organic chemistry and the creation of life. So the static rendering is also suggestive of the dynamic process of analogy-building and reconciliation. The pattern is suggestive of further unfolding into a complete 37-pattern, to produce an outer Hexagonal Star or a “galaxy” of 12 hexagonal stars around the original, central hexagonal star. 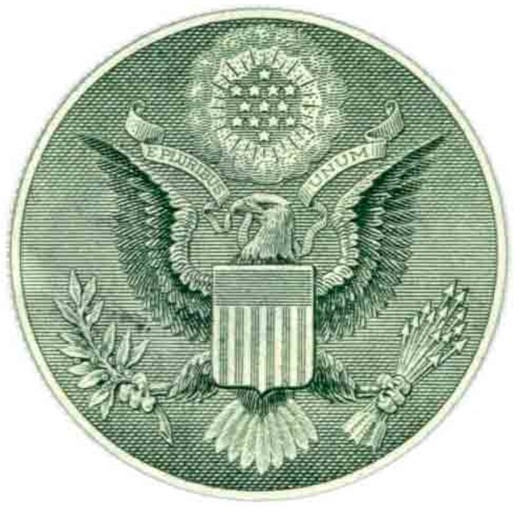 This pattern would be redolent of the stars in the USA Great Seal on the One Dollar bill (see next section). Possible Messages for USA Citizens. We may note here that the appearance of these two crop circle forms occurred shortly after the Islamic terror attack in London. I assume that among some of the many Moslems living in England there is soul searching about the stance of Islam in relation to Western Civilization (perceived by many Moslems as “Judeo-Christian” and as nurturing Zionism). Is it possible that this pattern contain some advice from heaven (or from the depth of the earth)? 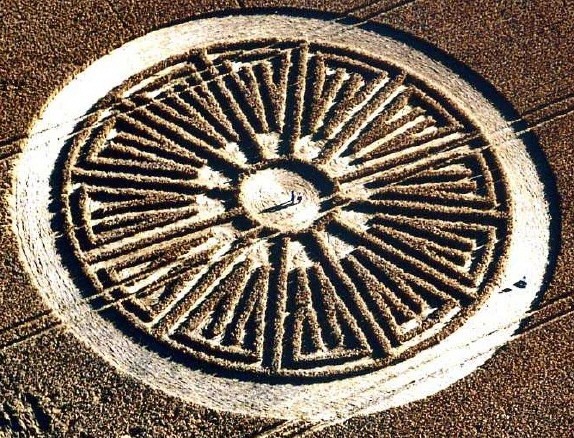 To my perception, there is a certain visual link between this crop circle pattern and the sacred patterns of Islam – of “the Star and Crescent” and of the Qa’ba-cube. The Star-and-Crescent indeed does not contain the hexagonal star, and Islam is supported by “the Five Pillars of Islam”. 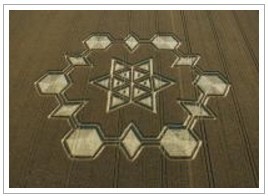 Yet by contemplating the pattern of the Star-and Crescent laid over this crop circle pattern, the conjunction hints as if there is something still missing in Islam – something symbolized by the star and the yearning for it, and which its attainment will bring about the hexagonal completion. It is possible to ask: What could be the sixth or hexagonal factor that Islam should complete? At least for me, as an Israeli-Jew, it seems good that Islam should reconcile with Israel, and with the symbol of the “Star of David” (which was, until the Israeli-Arab conflict, an attractive pattern for Islam, and is found in many Islamic shrines, for example the Great Mosque of Damascus). Since it is well known that the original Qibla of Islam was towards Jerusalem and also the eschatological expectations of Islam are directed to Jerusalem, it seems to me that the extra sixth element (the “Islamic-Zionist” one) is the adoption of the messianic direction of Jerusalem as a complementary Qibla and the place for the interfaith reconciliation. Each of the 6 sides of the outer hexagon of the Avebury Henge Formation can be seen as the connection between two sides. Here we “lifted” the elements of the Israeli and the Palestinian flags – held by most people to be conflicting and mutually-exclusive – and place them as the elements of their possible connection. There are two sides here – Right (blue) and Left (red). Both bear the strain between Up (heaven) and Down (earth). But instead of the Rhombic connection (that marks their distinctions and similarity) there is placed the guiding 6-pointed Star, that adds another dimension for their connection. This then allows for 12 types of connections. In the summer of 2002 there appeared (on 15 August) a complex ring pattern. This pattern got analyzed in depth by Allan Brown and the veteran crop circle and symbolic geometrician John Michell in an 80 page booklet. The pattern is reminiscent of the DNA Double Helix and was resolved as the selections in a virtual grid of 144 (12^2) arcs, creating a latticework of 1296 (6^4) 'curved squares'. We'll note here just the conclusion of John Michell in his chapter about the numbers implied by this pattern. It seems as if almost all of John's lifework studies of symbolic numbers and geometric pattern were enfolded in this single pattern, in particular his discovery and lifelong elaboration of "The New Jerusalem Diagram" of ancient cosmology. Also the "Star of David" Hexagram is implied in this pattern, containing the inner circle in its inner hexagon and reaching with its vertices the outer circle. The reader is referred to this book and to all John Michell's books. The Pythagoreans had to take an oath to keep the existence of this solid secret, and they regarded it as representing “the Fifth Element” of “Ether”. However Plato showed that this is the form of the football played with by the children of Athens, and regarded it as representing the earth or the Cosmos. Note that in Hebrew Gematria 48 is associated with 'Brain' (Mo'a?) and that in the Kabbalah the vital flow from above is that of 'Brains' (Mohin).